The greatest fear now is… the weather. Because the weather reports on Friday afternoon in Rome say that there will be light rain Saturday night, and light rain showers on Sunday morning. And if there is rain, everything about this historic beatification, which is shutting down all auto traffic in the entire area around St. Peter’s Square starting on Saturday at one o’clock in the afternoon, will grow more complicated. But hundreds of thousands of pilgrims who revered and loved Pope John Paul II and wish to be present at the moment of his beatification on Sunday morning are still expected to congregate in front of Piazza San Pietro throughout Saturday night, waiting patiently — even in the rain — until the entrances to the piazza open at 5:30 in the morning. The Mass will begin at 10 am. Pope Benendict XVI is expected to arrive at 9:55 am. At a final Vatican Press Conference regarding the beatification this morning, Father Federico Lombardi, S.J., told journalists that there are no official previsions for how many people will be present when the Mass begins. Current published estimates say Roman authorities expect some 300,000 people, but whispered rumors are circulating that the number may be 500,000, or even 1 million. If such numbers do choose to attend the beatification, in spite of possible rain, it will be a dramatic testimony to the power of the message and spiritual vision of Pope John Paul II, six years after his death on April 2, 2005. The Vatican has accredited 2,300 journalists to cover this event: 1,300 from television stations, 700 from magazines and newspapers, 230 photographers, and 250 from radio stations. The total number of nations represented by these journalists: 101. This is the clearest, simplest indication that the beatification is a global event of global interest. Journalists themselves are concerned that they will not be able to reach St. Peter’s Square. We are being told to come to the Press Office or a special section in the Square reserved for journalists between 4 and 5:30 am. After 5:30 am, officials say, we may not be able to make our way through the crowds which will circle St. Peter’s Square. The past 10 days included memorable experiences on a pilgrimage with a small group, as I mentioned in my last email. We traveled from Assisi, home of St. Francis, to Norcia, where Father Cassian Folsom, O.S.B., is rebuilding an abandoned Benedictine monastery at the birthplace of St. Benedict, to Cascia, the home of St. Rita, patroness of impossible causes, to Rome, where we were able to attend to be near Pope Benedict as he celebrated the solemn Easter Vigil and joyful Easter Sunday Masses. 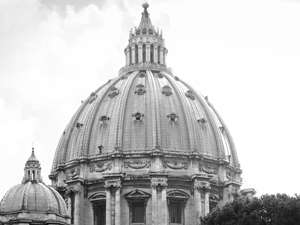 The beatification of Pope John Paul will bring this pilgrimage to a conclusion. If the sun breaks through the clouds on Sunday morning, well, that will be a blessing for many on that special morning.